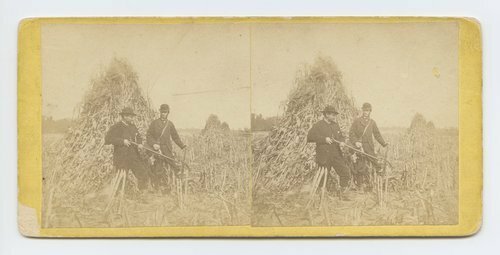 This stereograph shows two men holding rifles standing next to a shock of corn near Topeka, Shawnee County, Kansas. It is from Alexander Gardner's series, Across the Continent on the Union Pacific Railway, Eastern Division. Prairie hunting, Topeka, Kansas. 351 miles west of St. Louis Mo.